The Portland boys got off to a fast start and defeated host Westmoreland, 58-39, on Friday. The Panthers led by 15 at the end of the first quarter and extended that to 23 at the break. Westmoreland did cut the advantage to 13 on a couple of occasions, but the Panthers held on to post the double-digit victory. 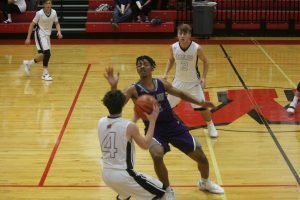 The Panthers sprinted to a 19-4 first-quarter lead as Austin Hicks dropped in a pair of 3-pointers, Mitchell Eagle tallied six, Jakeb Hester fired in five points including a 3-point bucket and DeQuan Bradley added a steal and lay-up. The scoring blitz continued in the second stanza as Dairius Bell scored six, Duncan Smallwood netted a 3-pointer and Gavin Parris dropped in a pair of foul shots for a 32-9 edge at the break. The second half was a little tighter as the Eagles outscored the Purple 30-26. The Eagles scored 10 of the game’s 12 points in the early minutes of the third period including a pair of 3-pointers from Kirby Bickerton to trim the lead 14, 34-19. Hicks uncorked a 3-point shot and added a 3-point play to put the Panthers on top 40-19 at the 2:09 mark. The Eagles finished up the third quarter scoring with four straight points, but still trailed 40-23. After a Dairius Bell basket opened the final eight minutes of action for the Purple, the Eagles scored six straight to close the gap by 13, 42-29. Portland increased their lead on four Eagle foul shots and a Bell slam at the 4:37 that created a 49-31 difference. After two charity tosses by Westmoreland, Bell connected on a floater before Casteel and Bickerton each launched a 3-point shot to pull to within 13, 52-39 with 2:30 left to play. Portland closed out the win at the free throw stripe as Hester made four straight, Bell blocked an Eagle shot and Hunter Hicks sank two at the foul line for the final margin of victory. Eagle led the charge with 15 with Bell contributing 13 and Austin Hicks adding 12. Hester recorded nine, Smallwood had three and Bradley, Gavin Parrish and Hunter Hicks followed with two each. Bickerton led the Eagles with 14. Portland travels to Gallatin Friday night and hosts Station Camp next Tuesday.